A Portland, Ore. bookstore is offering a dollar-for-dollar Kindle trade-in. If you’re an extreme curmudgeon who deems the Kindle to be a “soulless faux-literary technology,” the Microcosm Publishing Book and Zine Store in Portland, Ore., has a solution should you somehow come into possession of the device. Trade your Kindle — dollar for dollar — for old-school paper books. I spoke with Matt Gauck, a bookseller at the store, on the phone Wednesday night. He said the plan is to add the Kindles to the store’s collection of outdated technology. So far, storage limitations haven’t been an issue because they’ve had just two participants in the exchange program. If the trade-in catches on, however, they’ll need a plan B. One potential solution: Consider a tax-deductible donation to Worldreader.org. 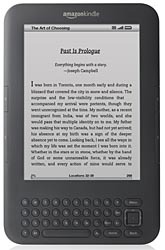 The nonprofit organization provides access to digital books in developing countries. In November, they launched a project in partnership with Amazon called the iREAD Pilot Study. Kindles were distributed to more than 500 children at six schools in Ghana, providing them with books and textbooks to which they wouldn’t otherwise have access. The preliminary progress report is worth a read and quite inspirational. Anytime technology can be used to make the world a better place, it’s a success in my book.